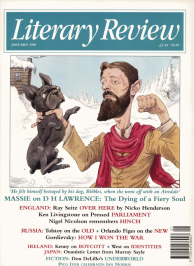 One man lived D H Lawrence’s life; it has taken three to write it. John Worthen covered D H Lawrence: The Early Years 1885–1912; Mark Kinkead-Weekes was responsible for the middle stretch, D H Lawrence: Triumph to Exile 1912–1922. Now David Ellis, to whom the home straight was assigned, has carried the story to the finishing post. It is fair to say that when assignments were handed out, he drew the short straw: Lawrence’s life got less interesting and less dramatic as it went on. The poor man cannot be blamed for that; for the last three or four years he got steadily weaker as tuberculosis fastened its grip. He was too obstinate to go to a sanatorium, where he might have been cured, and nobody was able to persuade him otherwise. Frieda seems never to have tried.